Brayden dreams for thirty nights, tortured by the vision of a beautiful woman. When Ariel Williams walks into his inn, he sees that she's the one he's been obsessed with in his night time journeys. But Ariel is fleeing an arranged marriage and keeps shyly to herself, until the worst happens and by mistake she casts a spell on a guest. 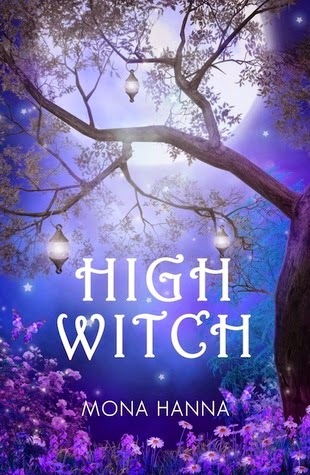 Brayden works with Ariel to help her control her magic but discovers she's a High Witch - one of only three witches in the world with a rare kind of power. Immediately the two must flee; evil warlock Julius wants to enslave Ariel - mind, heart and body. Julius and his lover the High Witch Nadia will stop at nothing to capture Ariel, and the danger threatens to tear Ariel apart from Brayden. Ariel's only hope is that her love for Brayden and her newly-discovered powers are strong enough to save them. Mona Hanna is an author of fantasy/romance books. She enjoys writing about love, magic, conflict, trials and the joy of overcoming them. Mona enjoys reading, movies, chocolate, and adores cats. She hopes to release many more fantasy books in the years to come. I thought this would be a story all about a High Witch, and it was, but it was mostly a romance novel. The relationship and romance between Ariel and Brayden is sweet. Keep in mind Ariel is the High Witch, so it also has its' share of adventure along the way too. I really liked the unpredictable ending. Not at all what I anticipated, but that was good. Lots fo paranormal romance fans will think this is a solid read. It is good, just not great. Maybe with the second book, Witch Emerging, it will be a little more exciting. I look forward to finding out. **No compensation was received for posting. Compensation will be earned if purchases are made from the links within. This copy was won. Opinions are owned by this site.